Emails are a common method of communication for both internal and external use. Guidelines for ensuring that emails are consistent with our brand guidelines are below. If you want to create a more sales-oriented product/business e-mail campaign or newsletter, please refer to our Marketo Email Template guidelines below. The best email subject lines are short, descriptive and provide the reader with a reason to explore your message further. Splashy phrases more often cause your email to be ignored rather than make them stand out. In keeping with our brand guidelines, email header images should not be changed or personalized with your particular header (e.g., for a project, initiative or team name). Instead, use a blank version of the “Simple Email Header” shown below and insert a short header line in your subject line as described above instead of in the image. Also, please note that often images are blocked depending on the settings of Outlook. (You will only see a white area with a small red cross.) So, any text displayed in an image may not be seen. Email banners featuring a personal portrait and the “A message from…” text are reserved for use only by the CEO and Senior Leadership Team members. As an alternative, one of the following jpegs may be inserted at the beginning of an email to act as a header. When creating emails, maintain a strong type hierarchy and keep formatting clean and simple to allow for easy reading and navigation. The key content of your message should be placed “above the fold.” That is to say, at the top of the email, within the area first visible without scrolling. The font used for your email should be Arial. Headlines should be the largest-sized text on the page. Text that immediately follows headlines generally should be sized smaller than headlines, but larger than body text to allow for a quick, easy read. Paragraph headings should be Medium or Bold, using core colors or the same color as body text. Body text should be set in Arial Regular in Xylem Gray. Use color or bold treatments sparingly and only to attract attention to key points. When there is concern over the legibility of Xylem Gray, use black. Avoid excessive use of imagery or graphic elements. When images are necessary, be sure to adhere to the following guidelines and refer to the samples provided. Most email communications should be text only. Imagery should be used only in certain categories where it is important to engage the reader visually (e.g., HR Benefits and Wellness programs or Xylem Watermark initiatives). Make sure any imagery used is in line with our corporate photographic style described on this site. Place images that extend the full width of the email either at the top of the message as a compelling introduction, or at the bottom of the message as a sign off. Smaller images should be placed in a column on the right side of the message. For best readability, the right-side column should not be greater than 30-40% of the total width of the message. Some examples are provided below. The width of your email should not exceed 600 pixels. Make sure to add “ALT tags” behind images to provide a clear text alternative for any image that does not load. Keep image file sizes under 45 kB to ensure quick loading and conserve internal server space. Save images using the RGB color space at 72dpi in JPG or PNG format. Animation should be used sparingly, as it can be a distraction to the message and increase the file size. Various templates have been designed for use in Marketo. If you are unfamiliar with the use of Marketo, please contact your regional Digital Operations Manager. These templates are to be used for multiple product brand communications. 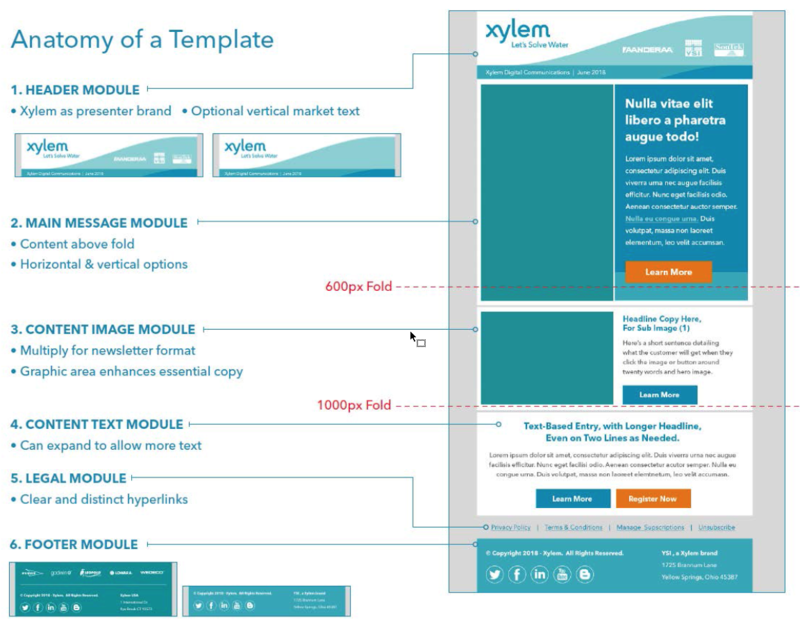 In multiple-brand scenarios where more than 3 brands are shown on a page at a time, Xylem should clearly be shown as the prominent brand in the header. The product brand logos are placed in white on a blue background in the footer. These templates are to be used for multiple product brand communications, where it is necessary to show the product brands in the header. This is only allowed for a maximum of 3 brands. 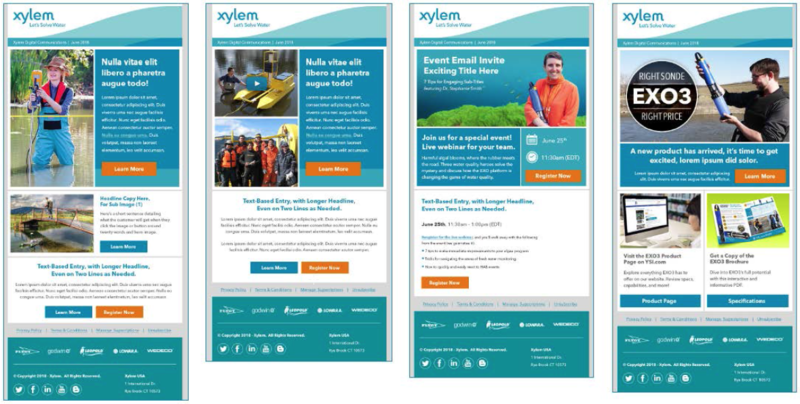 Xylem should clearly be shown as the prominent brand in the header and in color, the product brand logos are placed in white in the wave.